Swamp Pop music lovers get ready because this weekend is your weekend! 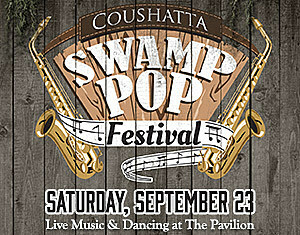 The Annual Coushatta Swamp Pop Festival is going down in Kinder, Louisiana at Coushatta Casino Resort this Saturday September 23rd. The legends of Swamp Pop and Louisiana music will all be there from Johnnie Allan to The Boogie Kings to Tommy McClain just to name a few. I will be your host for the event! Get ready to cut a rug on the 3600 square foot dance floor inside the air conditioned Pavillion. This Saturday you will get a chance to go back in time and hear all of your favorite artist sing their biggest hits. Advanced tickets are on sale at ticketmaster.com and at the Coushatta box office.